I'm not a big fan of desserts. We didn't grow up with a lot of sugary things in the house, so I never really acquired a taste for them. Occasionally I'll get a craving for something sweet, but it's not a common occurrence for me. I do, however, love pastries. There's something about thin layers of dough with butter in between, baking into a crispy little pillow of deliciousness that just fascinates me. Sweet or savory (I'm a definite fan of spanikopita), I love the texture and the buttery taste. Start with the filling. Combine the pecans, brown sugar, and cinnamon in a bowl and mix well. I used a small grinder for the nuts, but have in the past just put them in a plastic bag and used a meat tenderizer to break them into small chunks. A slap chop would have the same effect. Now for the fun part. First, don't give in to the hype over how difficult phyllo dough is to use. It's not. It might be hard to make from scratch (which is why I'm not even attempting it), but it's pretty easy as long as you work at a good pace. While assembling, you can use a damn towel over the dough to keep it moist, but unless you take an hour to assemble the baklava there is absolutely no need. Begin by assembling a workstation. I used a 9" x 9" baking dish, but because of the shape of the phyllo dough a 9" x 13" would definitely be easier. 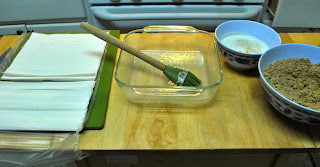 Either one will work with this process, but if you use the smaller baking dish you'll need to trim the phyllo dough. (Save the extras! See below.) I like to have the dish in front of me, with the butter right next to the dish and the dough on the opposite side. Keep the filling nearby. Start by brushing the baking dish with some butter. Lay down two sheets of phyllo dough. Brush the top layer with butter. Lay down two more sheets of dough. Brush the top layer with butter. Repeat again with two more sheets of dough. These six sheets with butter separating every two layers will be used in between each layer of filling. If you are doing one filling layer, you should have many more layers here. Make sure to use thin coatings of butter, otherwise you'll run out before you finish. If you're like me and only make desserts for the occasional splurge, then go ahead and melt some more. Separate the filling into three equal amounts. Spread one-third of the filling evenly over the dough. Continue building layers of dough, topping with a layer of filling, and more dough. For the top I prefer to use whatever dough is leftover, even if it's more than six layers. Top off with butter. Once finished, take a sharp knife and carefully cut into squares, diamonds, or whatever shape you wish. I went with a simple square shape for this, but a diagonal cutting would easily turn these into triangles. Some people like to bake halfway, then cut, then return to the oven. I found both ways to be challenging, but cutting first gave less opportunity for any damage to the top layers of the dough to occur. Bake in the oven for about 45 minutes, until the top is a golden brown. You may need more or less than 45 minutes, depending on your oven, so watch it carefully. While this is baking, make the syrup. Combine the brown sugar, water, honey, and lemon juice in a small pan and bring to a boil. Be very careful as this can boil over easily. Reduce to a simmer and allow to reduce down until it thickens slightly, about 10-15 minutes. (The foam you will see is actually beeswax from the honey. There's no need to remove this, but if it bothers you feel free to skim it off.) Set aside and allow to cool. Once cooled, add in the rum. By now the baking should be finished. Remove from the oven, but be careful not to tilt it too much as the melted butter is now molten and could spill out and cause some pretty painful damage. Pour the syrup over the top of the baklava. I use a ladle and try to focus on getting the syrup in the cracks and along the edges. Go slowly; the baklava is hot enough that it will reheat the syrup, making it flow easier into those cracks. Use your eyes here: if you think it's reached "maximum capacity" and won't take anymore syrup, go ahead and stop. (You can use the leftover syrup for pancakes. It's quite delicious!) In my own batch I went a little overboard, but I like it to be extra gooey. Now the hard part: resisting the urge to dive into this. I've found that it's best to stick it in the fridge and let it cool overnight. The syrup thickens quite a bit, and the pieces are much easier to remove. (For that first piece, use a couple of forks before trying to get it out with a spatula or spoon.) You can reheat it in a 200 degree oven if you want to serve it warm, but it's just as delicious cold. I was going to share the nutritional information for this recipe, but it's quite scary. Let's just say it's not diet food and leave it at that. So, you have some extra dough leftover? Some extra butter? A bit of lunch meat and cheese in the fridge? Let's put it all to use! I cut the remaining pieces I had into two inch strips. Using the same method as building the baklava (two layers of dough, brush with butter, repeat) and placed the dough in a cross pattern. In the middle went some layers of sliced meat and a small square of Muenster cheese. This went into the oven for about 30 minutes. Absolutely delicious. I have never been a big fan of baklava, however your inspiration to use rum is brilliant. I am sure this recipe will make me a convert.